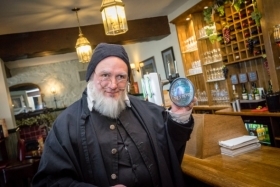 Many of the characters featured on the Stirling GhostWalk are based on historical characters. In many cases the truth of their lives is almost as surprising or strange as the legends they have inspired. One such is the ‘Chaplain to the Fairy Queen’, Robert Kirk of Aberfoyle. These are the words of a most uncommon clerical gentleman, the Reverend Robert Kirk – born in Aberfoyle in 1644, and Church of Scotland Minister to the village’s largely Gaelic-speaking people from 1685 until his death in 1692, aged just 47. Having grown up in a Scotland riven by involvement in the bloody conflicts of the English Civil War – Royalist, Roundhead and Covenanting forces fighting for the ideological hearts and minds of the people in the pulpit as much as the battleground - Robert Kirk took refuge in his books. A graduate of the universities of Edinburgh and St Andrews, he was a Greek scholar of great renown, involved in the production of Bishop William Bedell’s An Biobla Naomhtha, the first version of the Bible in Gaelic, published in London in 1689. His own edition of the Metrical Psalms of David - Psalma Dhaibhidh an Meadrachd – had been printed in Edinburgh five years earlier. Appropriate pursuits for a bookish country preacher, you might think. Quite so. His other chosen area of study was just a little more surprising. Kirk was not – as one might expect of a dour Calvinist cleric (a breed not exactly famous for their tolerance for superstition) – inclined to condemn such beliefs from the pulpit of the presbytery as the ‘work of the devil’. Instead he gathered accounts of haunting, and local lore relating to the fairy-folk – the Sleagh Maith – and set them down, noting the similarities and correlations between tales and traditions from different regions, just as modern anthropologists and ethnographers might do. It has to be noted, of course, that his studies were greatly influenced by his own Protestant faith. He set down much of what he learned in ‘The Secret Commonwealth’ (full title, 'The Secret Commonwealth or an Essay on the Nature and Actions of the Subterranean (and for the most part) Invisible People heretofore going under the names of Fauns and Fairies, or the like, among the Low Country Scots as described by those who have second sight’), completed around 1691 – but unpublished until Sir Walter Scott rediscovered Kirk’s magnu opus, in 1815. Whether Kirk was fully convinced by all the accounts of the strange phenomena related to him is open to question. His heartfelt conviction was that if these curious beings did exist, then they were as much part of God’s Creation as any of his flock...and as worthy of his Ministry! His desire to bring his Christian faith to the Fairies, provides a logical link to Kirk’s scholarly work. The Gaelic-speaking peoples of Scotland were often scorned as near savages by their more sophisticated English-speaking Lowland peers, and the divisions between the Protestant south and pockets of Catholic-Royalist support in the Highlands during the Civil War had increased suspicion of these ‘Scots-Irish’. Many, of course, were Protestant – but considered warily, on account of their strange language and customs. Similar tensions would occur during the following century’s Jacobite conflicts. Kirk’s desire to bring the Bible to the Gaels in a language they could understand was fueled by a desire that they might be included more fully in the Protestant congregation. A desire to perform a similar service for Fairies was a logical extension of this idea – though a rather more ambitious one, in oh-so many ways! And thus we come to the lasting legacy of Aberfoyle’s ‘Fairy Minister’. 20th-century Scots folklorist Stewart Sanderson. One of the great popularisers of Kirk’s work in the modern era, describes how the Reverend Gentleman ‘was in the habit of taking a turn in his nightgown on summer evenings on the fairy hill beside the manse, in order to get a breath of fresh air before retiring to bed’. 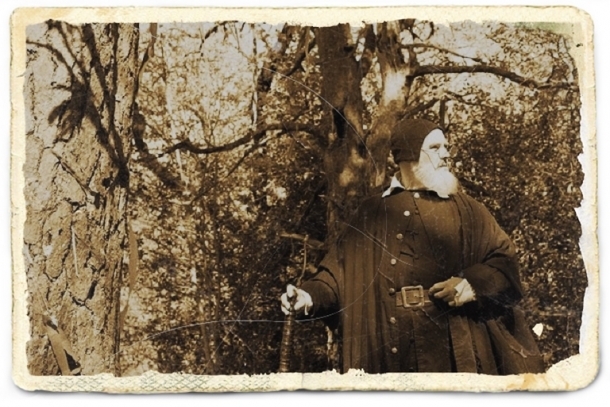 On one such evening – 14th May 1692 – he did not return home to the Manse. His body was found shortly after, apparently lifeless, on the Fairy Knowe, Doon Hill. Of course rumours quickly spread that he was not dead at all – but enchanted. The Sleagh Maith had taken exception to Kirk revealing their secrets in his book, and spirited away his mortal flesh - that he might serve his penance as Chaplain to Mab, the Fairy Queen. Should anyone care to check, the gossips claimed, they’d find his grave quite empty. Another tweak to the legend has it that Kirk’s shade somehow manifested to a cousin, Graham of Duchray, swearing that he would appear once more at the forthcoming Baptism of his newborn daughter. At that time, he said, Graham should cast an iron dagger at his phantom – iron being a traditional remedy for Fairy magic – and he would be released. Kirk appeared, as promised. Graham took fright, and fled the Kirk - leaving the iron dagger unthrown, and poor Robert a prisoner in the Fairy realm. Fittingly enough, given Kirk’s reputation as 'Scotland's First Folklorist', this particular episode is not related until long after Kirk’s death, and bears a striking similarity to a number of the Germanic legends relating to Theoderic the Great. Within the modern age, Kirk’s ‘Secret Commonwealth’ has found a popularity its author could never have dreamed of – among folklorists and believers in the ‘Good People’ alike Many regularly make pilgrimages to the top of Doon Hill, to picnic on that pretty knowe, or to tie a ribbon or token to the trees – a tribute to the Fairy Queen, or perhaps to her Chaplain! 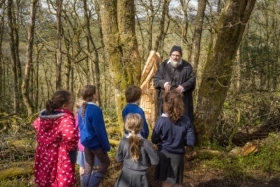 On 11th May 2015 the Stirling GhostWalk's Happy Hangman, David Kinnaird, was asked by the Aberfoyle Traders' Association to entertain local children on Doon Hill in the guise of Robert Kirk, regaling them with his curious tale. 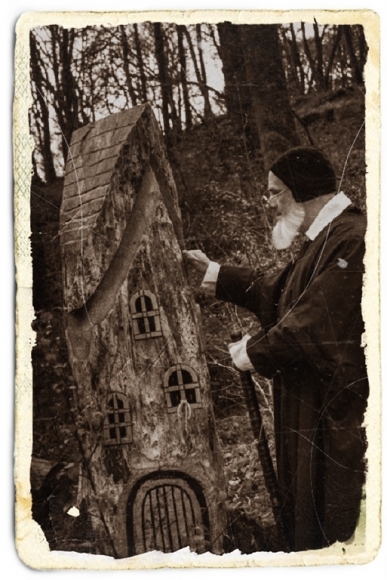 Having featured the Reverend Gentleman in past GhostWalk scripts, he was happy to oblige the citizens of The Faery Capital Of Scotland.